Only the finest herbal ingredients are used in Mammorex! Mammorex is manufactured in an FDA inspected & FDA registered facility. All Mammorex ingredients are recognized as GRAS. (Generally Recognized As Safe). Other Ingredients: Gelatin, Cellulose, Silicon Dioxide, Vegetable Stearate. 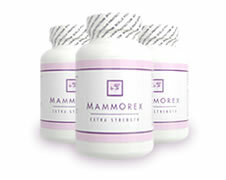 MAMMOREX works best when taking 3 capsules per day. Drink at least an 8 oz. glass of water with each serving of MAMMOREX.